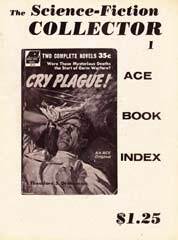 In 1976, when I started publishing The Science-Fiction Collector, I was a part-time bookseller (using the proceeds to finance the more expensive pulps I needed to complete my collections. At the time, I had determined I was less than 200 issues away from having every English-language sf, fantasy, and horror magazine published to that date, and most of what I was missing was early Weird Tales, and some British and Australian mags). My science fiction collection at the time was about 20,000 volumes, as I had been collecting avidly since the age of 15, in 1962. I started the magazine with the idea of sharing information I had gathered in the process of building my collection, as I had always lamented the lack of sources of bibliography for the completist in those pre-internet days, and it tied in well with my bookselling activities. A final issue was printed in an 11,000 copy run (instead of the usual 3,000), in a newsprint, tabloid-size format, in conjunction with my catalog #41 from my company, Pandora's Books (I now operate as www.bookitinc.com). My subcribers got a copy, plus all of my customers for my mail-order business, and the remainder were given out at the World Science Fiction Convention in 1981. At that point, my mail-order business, and growing children, ate up all my time, and the magazine ceased publication. Publishing the magazine was a wonderful experience, and put me in touch with a lot of great fans and authors. All fifteen issues of The Science-Fiction Collector are now available here. These are scans of the originals and are not searchable. File sizes range from 5MB to 11MB.